The month of October 1979 in Jim Crockett Promotions began in earnest with the first television show of Mid-Atlantic Championship Wrestling in October, taped from the WRAL TV studios in Raleigh, North Carolina on October 3rd. On this edition of Mid-Atlantic Championship Wrestling, two developing angles would be continued that would carry over for the rest of the year of 1979. In one of the developing feuds, Ricky Steamboat came out and told announcer Bob Caudle and the Mid-Atlantic area’s viewing audience that all of the necessary paperwork had been completed, and that he and Jay Youngblood were now a “certified tag team” in the territory, and renewed the challenge that Youngblood had made previously for a bout against NWA World Tag Team Champions Paul Jones and Baron von Raschke. In the second simmering feud that was discussed on the October 3rd TV show, Bob Caudle talked with Buddy Rogers about the NWA levying the largest fine in history against Rogers and Jimmy Snuka for their injuring “Mr. Wrestling” Tim Woods. Caudle also brought up for the first time the specter of Rogers hypnotizing Snuka and the other wrestlers in Rogers’ stable. While on the subject of the “Wildman” Jimmy Snuka, it has to be said that in his first full month as the United States Heavyweight Champion, Jimmy was quite impressive. Three towns in the territory got to see multiple U.S. Title defenses by Snuka during the month of October. Norfolk, Virginia saw Snuka lose by disqualification to the “Hawaiian Punch” Ricky Steamboat on October 4th, but Snuka came back to the Scope Coliseum on October 25th, and scored an impressive victory over “Nature Boy” Ric Flair. Greensboro, North Carolina also got the treat to see two United States Title defenses by Jimmy Snuka during the course of the month, both against the stiff challenge of Ric Flair. On October 7th, Jimmy got the best of Ric but in typical “Nature Boy” fashion, Flair got the better of the return bout at the Greensboro Coliseum on October 28th, beating Snuka by disqualification where even two referees couldn’t maintain order! The other town in the territory that saw two October U.S. Title defenses was Roanoke, Virginia, and in both of these matches Jimmy Snuka defended against Ricky Steamboat. 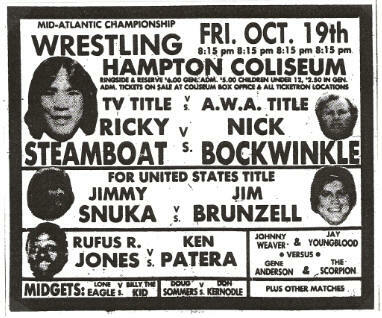 On October 7th, the Roanoke Civic Center saw Steamboat upend Snuka by disqualification in a rugged encounter. In the Roanoke rematch two weeks latter, Jimmy turned the tables, defeating Ricky in a No Disqualification and No Count Out slugfest. A visibly shaken and humiliated Youngblood came out later in the program and asked Bob Caudle whether Jones and Raschke were going to be on the Mid-Atlantic TV program the following week. When Caudle answered in the affirmative, Youngblood and Steamboat said they would have a surprise for Jones and Raschke next week. Mid-Atlantic Heavyweight Champion Jim Brunzell spent most of the month of October snuffing out the challenge of former Mid-Atlantic champion Ken Patera. Brunzell successfully defended his coveted belt against Ken from one end of the Mid-Atlantic area to the other, for instance, handling Patera and his awesome strength on October 7th in Greensboro, North Carolina, October 8th in Greenville, South Carolina, and on October 21st in Roanoke. Raleigh was also the site of two intriguing Brunzell Mid-Atlantic Title defenses during the month. On October 2nd at the Dorton Arena, “Jumpin’ Jim” bested Canadian Heavyweight Champion Dewey Robertson in a mainly scientific match. Three weeks later in Raleigh, Brunzell squared off with fellow fan favorite Johnny Weaver. A strictly scientific bout between these two turned a bit rough towards the end, with Weaver prevailing when Brunzell was unable to beat a ten count to get back into the ring. While Johnny got his hand raised in the October 23rd match, a stunned Brunzell nevertheless retained his strap. October’s card at the Maple Leaf Gardens in Toronto, Canada had a terrific Mid-Atlantic battle as its main event. On that spectacular October 15th show, Jimmy Snuka successfully defended his United States Heavyweight Championship, defeating Ric Flair at the 13:31 mark after a spirited contest. The final match on the show also had a Mid-Atlantic flavor, as Jim Crockett Promotions regular and Canadian Heavyweight Champion Dewey Robertson wrestled to a draw with AWA Heavyweight Champion Nick Bockwinkel, batting for Nick’s belt. The match was stopped when the 10:30 p.m. curfew was reached. 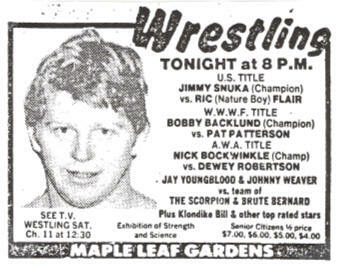 Bob Backlund also defended the WWWF title on the card. 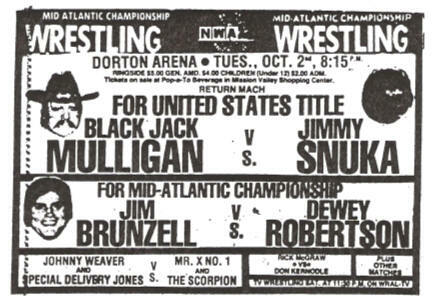 A “Mid-Atlantic match” earlier in the night saw Jay Youngblood and Johnny Weaver top Brute Bernard and the Scorpion. 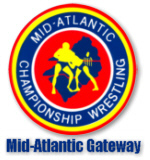 The October 17th taping of Mid-Atlantic Championship Wrestling television was loaded with noteworthy occurrences. AWA Heavyweight kingpin Nick Bockwinkel was interviewed at the outset of the show, and came off as a very cool and articulate customer, though he didn’t appear very impressed by the talent in the Mid-Atlantic area. Also early in the program, “Mr. Wrestling” Tim Woods reemerged saying he was recovering well from his injuries suffered at the hands of Buddy Rogers and Jimmy Snuka. Woods also brought out a “Wanted Poster” that said he wanted both Snuka and Rogers out of wrestling. Woods said he would be distributing these “Wanted Posters,” free of charge, at all of the arenas that he would be going to. Mr. Wrestling was also sporting a Louisville Slugger baseball bat, saying this “new friend” would be insurance for him against a possible third attack by Snuka and Rogers. Finally and quite significantly, Mr. Wrestling removed his white mask voluntarily, saying how much it meant to him and that no one had ever taken the mask off of him, and that he would leave the mask off until he evened the score with Snuka and Rogers. This gesture would show just how seriously Tim Woods was about getting even with Rogers and Snuka! Mid-Atlantic Championship Wrestling television that was taped on October 17th also saw a rare in-person wrestling match by “The Eighth Wonder of the World,” Andre the Giant. Andre easily dispatched the wily veteran Bill White, and later when he was interviewed by Bob Caudle, said that Jimmy Snuka was no longer his friend after being turned bad by Buddy Rogers, and that when he returned to the territory that he wanted a U.S. Title match against Snuka. Interestingly, Rogers said that he would consider a match, but only after the Giant made a reputation for himself! But the most important segment that came out of the October 17th Mid-Atlantic TV show grew out of a seemingly innocuous match between World Tag Team titlists’ Paul Jones and Baron von Raschke and the mid card team of Tony Garea and Johnny Weaver. The match appeared to be progressing normally, until Ricky Steamboat came down to the ring on two separate occasions and whispered something into the ears of Garea and Weaver. Very soon thereafter, with the help of Garea and Weaver, Steamboat and Youngblood were able to bring a can of yellow paint and paint brushes into the ring, and Steamboat and Youngblood were able to paint yellow streaks down the backs of both Jones and Raschke! 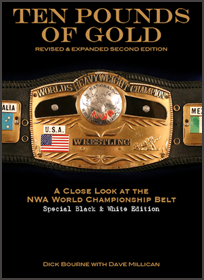 The “good guys,” in a very unique way, had made their point that Jones and Raschke were YELLOW, being afraid to wrestle them for the NWA World Tag Team Titles! The stunt definitely had its desired effect, as at the end of the TV program, an enraged Jones and Raschke, unable to get the yellow paint off of themselves, agreed to wrestle Steamboat and Youngblood on Mid-Atlantic Wrestling television the following week! This was indeed a rare occurrence, where the World Tag Team belts were defended on television, so the October 24th edition of Mid-Atlantic Championship Wrestling was looking to be a huge event. Prior to their Title defense on TV on October 24th, Jones and Raschke had a successful month of World Tag Team Title defenses. They adeptly handled their final two defenses against former champs Ric Flair and Blackjack Mulligan, first on October 7th in Asheville, North Carolina and then in a wild melee in Charlotte, North Carolina where Andre the Giant was the special referee! Also during October, Jones and Raschke fended off Title challenges from the formidable duos of Ric Flair and Rufus R. Jones, Ricky Steamboat and Jim Brunzell and Blackjack Mulligan and Rufus R. Jones. And in the two days prior to the big Title match on television, Jones and Raschke actually defeated Steamboat and Youngblood cleanly by pinfall, first on October 22nd in Greenville, South Carolina and then again the next night at the Dorton Arena in Raleigh. The NWA World Tag Team Title bout between Paul Jones and Baron von Raschke versus challengers Ricky Steamboat and Jay Youngblood on the October 24th taping of the Mid-Atlantic Championship Wrestling television show was certainly one for the ages! Color commentator David Crockett said that after getting humiliated by the “painters” the previous week, Jones and Raschke signed contracts for all kinds of matches against Steamboat and Youngblood, and even made sure a 30 day return clause was put in the Title match on TV, just in case the reigning champions lost. 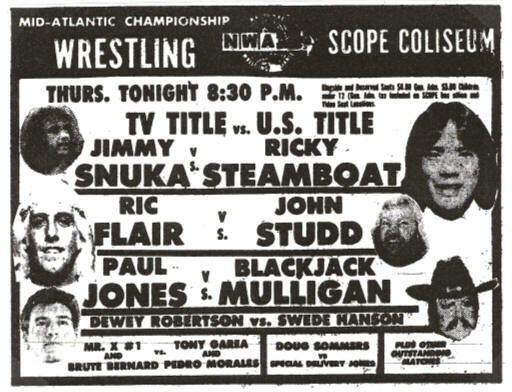 Announcer Bob Caudle chimed in that it he thought it was likely that Steamboat and Youngblood would in fact prevail in the televised Championship match. The Title match produced great emotion on both sides, with Jones and Raschke bent on revenge from being “painted yellow” the week before, and Steamboat and Youngblood looking to prove themselves as legitimate championship contenders. Both teams used up their one save early in the contest. Jones nearly had to submit when Steamboat got his left arm in a hammerlock and proceeded to “drive” it until it was almost pulled out of the socket. Bob Caudle commented that the Baron didn’t get in any too soon to save Paul, and Jones was noticeably favoring his left arm for the balance of the match. As the match neared its conclusion, Jones appeared to deliberately throw Youngblood over the top rope which would have resulted in an automatic disqualification, which in turn would have saved the belts for the Champions. However, referee Sonny Fargo ruled that Youngblood’s flight over the top rope did not go far enough to warrant a disqualification. This turn of events seemed to discombobulate the champs, and ultimately Raschke was hit with a rapid-fire move off the ropes which led to a three count giving Steamboat and Youngblood the victory and the World Championship belts! Commentator David Crockett squealed with joy as he handed the Title belts to the referee Sonny Fargo, who in turn gave them to the new Champions! As soon as the program returned from commercial break, things went downhill quickly for the new Champions. Raschke threw some sort of powder into the eyes of Youngblood, disabling the young Indian star. The Baron followed up by whacking Youngblood over the head with a chair several times. Without his partner, Steamboat fell prey to the vicious tactics of Jones and Raschke. Paul put the Indian Death Lock on Steamboat, and wouldn’t let go, and to make matters even worse, Raschke hit Steamboat with a chair on his injured knee several times. As the TV program went off the air, Steamboat’s knee appeared severely damaged. The October 24th Mid-Atlantic TV show also had a very interesting segment with Buddy Rogers, talking about Tim Woods who had been on at the outset of the program. Buddy told the fans at home that he hated Woods more than any wrestler alive, with the reason given being that Tim supposedly cost Rogers more than two million dollars he would have received in purses in wrestling. Rogers went on to say that Woods was a “rat fink,” telling the world a secret that cost Buddy all of this money. In the interview, Rogers also went on to tell Bob Caudle that he hypnotized Jimmy Snuka and John Studd about 15 minutes before they went out to any ring! Ricky Steamboat’s knee injury not only placed into doubt his availability to defend his newly won one half of the World Tag Team Titles, but also his NWA Television Title. During October, Steamboat had a number of spirited contests with Jimmy Snuka, where Snuka’s U.S. Title was at stake as was Ricky’s TV Title, for the first 15 minutes of the bout. Roanoke saw two of these battles between Steamboat and Snuka during October. On October 7th at the Roanoke Civic Center, Steamboat defeated Snuka by disqualification in a U.S. Title versus TV Title slugfest. In the return battle two weeks later in Roanoke, Jimmy prevailed in a wild No Disqualification/No Count Out match where again both championships were on the line. Steamboat also had two bouts during the month where he put his TV belt on the line against another champion’s belt. The other champion involved was the AWA Champion, Nick Bockwinkel. On October 19th at the Hampton Coliseum in Hampton, Virginia, Steamboat and Bockwinkel fought to an inconclusive finish where each man kept hold of his respective strap. The next night in Winston Salem, North Carolina, the same result occurred between Ricky and Nick. The big man from Eagle Pass, Texas, Blackjack Mulligan, had an intriguing month of October. In the same month where his quest to regain the World Tag Team Titles ended, the “Jack” renewed an old singles feud with old enemy Paul Jones. Unlike 1975-77 when Mulligan was the villain and Paul was the fan favorite, the roles were reversed in 1979, and the fans loved seeing “Mully” whipping up on Paul! Fans in Norfolk on October 4th, Columbia, South Carolina on October 19th and Richmond, Virginia on October 26th witnessed Blackjack clobber Jones from one end of the ring to the other. On that October 26th show in Richmond, the start time for the matches changed to 8:15 p.m. from the 8:30 p.m. start time that had been in place for decades in Richmond. Another old feud for Blackjack also started back up at the end of the month, one that would continue to last for a very long time. Big John Studd and Mulligan rekindled their rivalry at the end of the month, and things between these two appeared hotter than ever! On October 21st in Roanoke, the “Battle of the Giants” between Mulligan and Studd went to an out of control double disqualification. Much of the same between these two took place in Myrtle Beach, South Carolina the next night. Studd didn’t come into those battles with Blackjack in the best of shape, as he had to fight Andre the Giant the previous two nights! On October 20th in Winston Salem, Andre and Studd fought all over the Winston Salem Coliseum, and on the previous night in Columbia, South Carolina, the “Giant” and Studd battled to a crazy double count out of the ring finish! The last day of the month saw major occurrences take place in the Mid-Atlantic area, and in the entire National Wrestling Alliance. Halloween night saw the in-ring return of “Mr. Wrestling” Tim Woods. Woods looked quite impressive in the WRAL TV studios on October 31st, having little problem in dispatching the veteran grappler Charlie Fulton. And on that same evening, about 7000 miles away in Nagoya, Japan, Harley Race was defeated for his NWA World Heavyweight Championship by the great Japanese star, Giant Baba. The Title reign for Baba would be quite short lived, before Race would quickly recapture his “ten pounds of pure gold” in early November. 1. Ricky Steamboat and Jay Youngblood---This young popular duo aced the World Tag Team Titles towards the end of the month, after a month or more of challenges. A downside to the amazing Title victory was the knee injury that Steamboat suffered after the match, putting his status up in the air. 2. Jim Brunzell---In his first full month as Mid-Atlantic Heavyweight Champion, Brunzell definitely proved he had the “stuff” to carry this prestigious belt, beating back the challenge of the increasingly desperate former champ Ken Patera. 3. Jimmy Snuka---The “Wildman” from the Fiji Islands continued to be a terror during the month of October, being egged on by his notorious manager, Buddy Rogers. However, a looming showdown with “Mr. Wrestling” Tim Woods was about to come up over his horizon. 1. Ken Patera---Even despite being added to Buddy Rogers’ stable of wrestlers, Patera was unsuccessful in his numerous attempts to wrest the Mid-Atlantic Title away from Jim Brunzell. This would be Ken’s last full month ever in the Mid-Atlantic area. 2. Paul Jones---During the month Paul got a “yellow streak” painted down his back, and soon thereafter lost his half of the World Tag Team Championships. In addition, Jones came out on the short end of a series of tough matches with massive Blackjack Mulligan. 3. Rufus R. Jones---Much like the previous month, the “King of Wrestling” was treading water, and was having difficulty in stringing together enough quality wins to move up the ladder to obtain the championship matches he coveted.